Here we find ourselves, once again, at the Etsy Artist once a month feature. 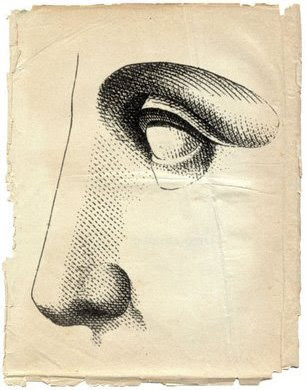 On this seventeenth day of June I bring you an individual I discovered rather auspiciously. One day on the front page of Etsy I saw an image of some brightly colored balls, I clicked on them because I thought the image might work nicely in a treasury. 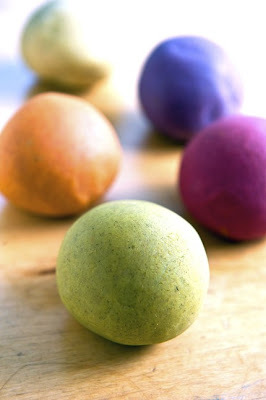 To my delight, I discovered that those colorful round objects were gluten free aromatherapy clay balls!! The creatrix of these enchanting and soothing clay balls is Kari Erickson of Seattle, Washington. Rather auspiciously my aromatherapy teacher and very dear friend Jade Shutes lived and taught aromatherapy in Seattle. Jade currently lives in back east in North Carolina with her sweet little son Soren and partner Matt. The three of us, Greg, Eve and myself had the pleasure of experiencing all of Kari's scent charming aromatherapy balls. We each seem to have our own favorite. Eve, my teen age daughter, adores the bright magenta colored ball scented with geranium essential oil. As she plays with it she remarked, "Nice texture, almost like its not there. It's as if your playing with air. The ball feels so nice in your hands, it's the perfect size and makes my hands smell great. I'd like to be able to take the geranium scented one to school and whip it out during stressful classes." Greg, who we refer to as the critic, was very impressed though and through. He loves the presentation, the materials and the graphics. His favorite ball is the Cardamom with Lemongrass and Lavender coming in second and third. As he played he remarked, "I like the consistency, it's very soothing to squeeze it in between my fingers." As I type this post I have just been kneading the Bergamot scented ball while drinking my Earl Grey tea. Wafts of bergamot float up from my typing fingers, how grand. These balls work on so many exquisite levels, I am so enchanted! First off they are vegan, made by hand and support a mother with two young children. Next, they are made with pure, essential oils so while you experience the tactile aspect of the ball and the joy of play the power of aromatherapy comes in as well. Once you are done the packaging suggests washing your hands, however if you are off to the office I suggest allowing the aromatherapeutic aspects of the essential oils to continue their work. We noticed that some of the balls are more fragrant than others. Although the Bergamot seemed light upon whiffing from the container, once I began handling it the aroma was much more prominent. These are probably the best kept secret on Etsy, I highly recommend getting at least one of these and experiencing them for yourself. I can see therapists utilizing these with their patients as way of unwinding and getting individuals to get out of their heads. perfect for taking along car or airplane trips. This Christmas they will make fantastic gifts for all ages, stock up now! and being in the kitchen have always brought me a sense of peace, a release from frustration, and a creative boost as well. And there's nothing like eating your creation when you're through! If only we could do that with other things we make. It's funny you ask that again, because I was reading one the giveaway with Xenotees on April 15th and her answer was the smell of tomato plants. I have to say that I agree with her wholeheartedly. My husband built me a greenhouse for Mother's day this year (romantic, no?) and it is full to the gills with tomato plants. There is something so intoxicating about walking in there. Magical. I have also just discovered Moroccan Chamomile. Oh wow. Of the clays that I make it is the most soothing to me. I keep one in my bag and get it out in the car or at random moments and just breathe it in. It's amazing how well it works. Since I AM the queen of a village, albeit a village of four, plus the occasional straggler, that should be an easy one! but alas, it's not.... I suppose I would like a village of easygoing, smart creative spicy people that still had the ability to work hard! So, a well fed, well rested, smart, zesty, fulfilled village. We'll get there some day, I hope. 4.) How did you find yourself creating clay aromatherapy balls? The evolution started really with the growth of my 1st daughter, Olimpia. As I said before I like to be in the kitchen, so it's natural that our activities are sometimes centered around it. I started by just making the plain ol' play dough recipes you can find on the internet and in activity books. Of course as time went by I started refining the recipe and just for fun started adding essential oils. We would experiment with what felt the best and smelled the best. Olimpia (she's 3 1/2 now) is a great tester. I started giving it to friends and some of it ended up in the hands of a therapist here in Seattle. She suggested that it would be better for her clients were it gluten-free. So I went back to the drawing board and came up with a recipe that is totally my own invention. And then, I must confess, the real push came when I read a horoscope by Rob Brezny that said that if I wanted to end up like Darwin and not like Alfred Russell Wallace that I had better hurry up. And 'Mama K's Aromatic Play Clay' was born. 5) As a work at home mom what tips can you give other work at home moms? I've got a lot of learning to do as far as that's concerned. One thing I'm trying to be conscientious about is not dividing my time and attention in a scattered way. I'm generally a fluid person, so it can be hard for me to set boundaries and stick with them. Work time is work time, play time is for play. Also it can be hard to feel like you're ever going to get anything done. But there's a lesson in Aesop's Fables that has been with me my whole life and that I think everyone should always remember: slow and steady wins the race. Thank you so much Kari for sharing a bit of yourself with all of us! I feel so blessed and grateful to have met you. 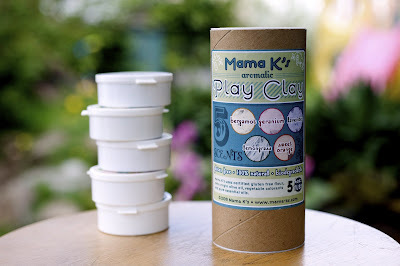 For the giveaway today Kari has generously selected her Aromatic Play Clay Tube of Five. This set of clay includes one a 4 ounce tub of each of the following: lavender/soothe, sweet orange/uplift, bergamot/ ease the anxious, lemongrass/inspire, geranium/balance and chamomile/relaxation. This is very generous of her, the containers are much larger than they appear in the photo above. Begin by leaving a comment on this post mentioning your favorite item from Kari's etsy shop. She would also appreciate any suggestions you have for her regarding her current products or suggestions for new items. You may only enter once and you must include your first name -and- etsy username or email address with each entry or it will not be included. 3. Each entry is printed and cut out, I then place the entries into a hat, basket or bowl and have someone handy pick a name from all the entries. We now choose a runner up. The giveaway ends Sunday, June 21st (The Summer Solstice) at 1opm PST with the winner announced on Monday, June 22nd. Please get the word out, these are really fabulous and the whole world kneads them. Thank you Mia for being the very first one! These are so fantastic. I've got you down, cheers! Indeed, gluten free seems like a challenge these days. I adore these aroma balls and can't wait for another session with them. The geranium is pretty special too...and works on stress as well balancing hormones. Pam, Vanilla would be great and I can see how Cinnamon around the holidays would be really attractive. i think i would really like the lemongrass one! the lemongrass and bergamot ones sound great to me. I love the orange scented one, so refreshing. Maybe something with peppermint oil since that can aide in headaches. Thanks for the giveaway! I'm also a blog follower now too! I sure could use a Sweet Orange play clay right at this moment - I need sweetening after a horrific exam this afternoon!! Perhaps create a rosemary, lemon and basil one - for stressful students such as myself! I can picture myself in an exam, squishing away to keep calm. :oP LOL, many thanks for the give away! 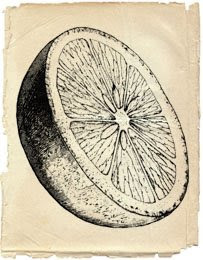 I think the bergamot and the sweet orange sound wonderful. What an amazing idea! I love the fact that these are so natural, gluten-free and made with EO. I can only imagine how lovely the bergamot would smell! I think a pumpkin spice, or an orange spice, would be very comforting to me, too. I also added MamaK as a friend on facebook! I love the Geranium scented play clay! My fav. item on her etsy shop is definitly the tube! Ive tryed and tryed to make my own playdoh and never get it to turn out right. Id love to try hers out. I love this product idea, especialy the gluten free aspect. I have several friends who are gluten intolerant and these would be wonderful gifts for them. My first thought looking at the site is that vanilla would be a great scent. I think geranium would be my favorite. I got em all so 3 entries for me please. I'll need to share this with my friend who has been going through some tough health issues. She works with Fimo clay a lot, and she will probably love this as a stress reliever! I love the sound of the lavender scented. Although lemongrass sounds pretty great too. I think I'll go for the lemongrass. What a cool idea! I like the Lavender, since I am dealing with depression and anxiety and lavender is very good for that. I signed up to follow your blog (I am just starting to create mine) and I became a fan of Mama K on Facebook (I just joined it today, but will set up a page right away) I found your blog via Twitter, since I follow Etsy and they tweeted it. Thanks for the giveaway. And I will read more on your blog. And maybe you will follow mine too once I get it set up! I want some of that sweet orange clay for my dest at work! I want the sweet orange clay for my desk at work! I'm thinking the chamomile play clay sounds like the best thing for my boys right about now! I like the Geranium Scented Play Clay! Thank you to all those who stopped in to leave a comment and enter the opportunity to win this spectacular Aromatherapy clay. As mentioned in the post, this giveaway closed at 10pm PST on June 21st. I will post the winner later today! !